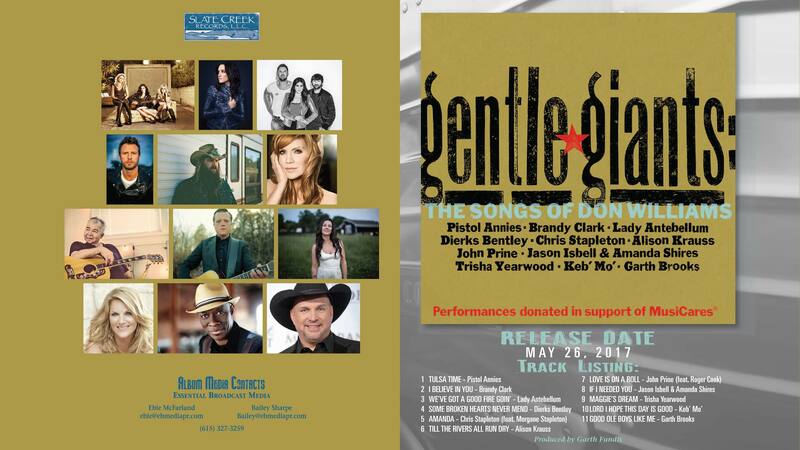 Purchase Gentle Giants: the Songs of Don Williams on iTunes! Wall Street Journal: Angaleena Presley’s potent solo album, “American Middle Class,” finds fresh images at the country-Americana borderline. Until now, singer-songwriter Angaleena Presley has been known primarily as a member of the edgy, straight-talking triumvirate who make up country music’s Pistol Annies. As the Spice Girls-style nicknames they adopted have it, she’s “Holler Annie” to Miranda Lambert’s “Lone Star Annie” and Ashley Monroe’s “Hippie Annie.” The “holler” reference is no joke. Ms. Presley, now 38, began life as a coal miner’s daughter from Beauty, Ky.; her mother is a real McCoy—of the family that once feuded with the Hatfields. Working as a cashier at a nearby Wal-Mart, while practicing the guitar she had taken up at age 15, Ms. Presley went on to experience some of the recurring challenges and dysfunctions of contemporary Appalachian life: the perpetual blue-collar squeeze; the struggle to get by as a single working mother, just barely middle class; the pill-addicted neighbors; the problematic marriage, for a time, to a man who drank too much. In the catchy, thumping opening cut, “Ain’t No Man,” fresh down-home similes multiply as Ms. Presley describes the estimable yet naive girl she started out to be, “busy as a saddle in a one-horse town, straight as a picture on a blind man’s wall.” You sense that the singer-songwriter could go on piling up those images all day and savor doing it—and the pleasure is infectious. There’s bite, wit and subtle sentiments—but little nostalgia and less sentimentality—as the songs, varied in rhythms and tone, follow what became of that girl “up and down the aisles of the American Dream,” as the memorable “Grocery Store” song puts it. The succession of song titles tracks the trajectory—“All I Ever Wanted,” “Pain Pills,” “Life of the Party,” “Knocked Up,” “Drunk,” “Surrender.” All of these originals were written by Ms. Presley, alone or in collaboration with such talented and widely admired country songwriting compadres as Sarah Siskind, Bob DiPiero, Luke Laird, Mark D. Sanders, Matraca Berg and Lori McKenna. The most emblematic song in the set, best capturing Ms. Presley’s unique sensibility in miniature, could be “Better Off Red,” one she wrote solo. On first listen it seems to express a straightforward longing for the life with a “front porch and a TV set” that she labored to escape. But then you notice that she is telling her mama this because her daddy doesn’t “give a damn” about the things that are on her mind, and that she would be “better off” back home only if “all the things I’ve learned would just fall out of my head.” Which, of course, they won’t—and she really doesn’t want them to. A wheels-within-wheels sophistication at work in that song and throughout the album, in both the words and the music—and a demonstrated willingness not to hold back on either just to reconfirm her down-home roots—places Ms. Presley on the borderline between mainstream country and Americana. One way to look at the whole Americana format is as American roots music that’s gone to college, designed for people who’ve been there, so it isn’t surprising that she should be at home in that neighborhood. The “outside, looking back in” perspective is reflected even in the CD’s photo images, of Ms. Presley playing the roles of a waitress, a rockabilly, a honky-tonk angel and, yes, also an old-school country “girl singer” dressed in crinolines. She seems to have filled all of those roles at one time or another; now she reflects on them. Some of the sounds Ms. Presley and her husband, Jordan Powell, bring to “American Middle Class” as its producers—samples of a monologue by her father; a cigarette lighter, barbecue pans and castanets credited as instruments, not just the steel and electric guitar and banjo—are out there on the modernist edge. But backup vocalists who include Patty Loveless and Chris Stapleton add to the album’s more traditional country side that is present as well. The one foot Ms. Presley has in mainstream country is seen, also, in an unmistakable pop sensibility at work in such mule-kicking numbers as “Knocked Up,” a hook-filled song of hers that grabbed attention in 2011 when sung by country’s Heidi Newfield. “Hammer a nail between your heart and your hometown, so you can carry this country on your back,” Ms. Presley sings in the album’s pointed title track. She’s referring to ways for the unheralded, small-town middle class to hang on—and to modern country music, too. It works both ways. jim@slatecreekrecords.com | © 2019 Slate Creek Records. All Rights Reserved.